Barwa Bank, Qatar’s fastest growing Shari’ah compliant banking service provider, congratulates Fawziya Al Abdulla, Group Head of Human Resources for winning a prestigious award in the Innovation category at the Qatar Businesswomens’ Awards for 2013, on 11th November 2013 at the St. Regis Hotel Doha, Qatar. 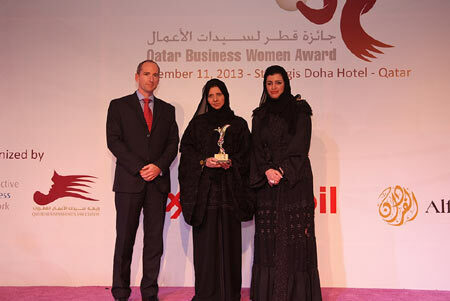 Qatar Businesswomen Awards for 2013 was held on the evening of the first day of the 4th Qatar International Businesswomen Forum (QIBWF) that took place on Nov 11-12, 2013 with participants from 39 countries. The Awards identify and pay tribute to Qatari women who contribute to Qatar’s society and economy through their significant professional or entrepreneurial achievements. Nine top Qatari business and professional women were recognized by the Qatar Businesswomen Association (QBWA) during the Qatar Businesswomen award ceremony held under the auspices of Qatar Foundation Chairperson HH Sheikha Moza bint Nasser. “QIBWF plays an important role in opening new horizons for businesswomen in Qatar, and receiving this award is a great honour. I’m extremely lucky to have a career that I enjoy and find highly rewarding and I hope Arab women are able to strengthen their leadership positions and realise the possibilities that are open to them” Al Abdulla concluded.